The building is wood framed with Cream City Brick exterior and cast decor. "The Jung Carriage Factory building is one of the City's most important 19th Century commercial and manufacturing structures. It was built on Pennsylvania Avenue, then the center of the City's commercial district, for Jacob Jung, an early Sheboygan industrialist, for the manufacture of horsedrawn carriages, wagons and sleighs. Many of the vehicles produced in the building are now on display at the Jung Carriage Museum in Greenbush. After 1890 the business was expanded to include a painting and interior decorating shop. 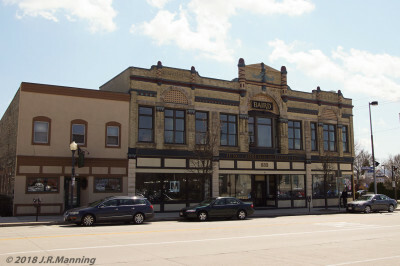 The unique facade design, showing some influence of the Richardsonian Romanesque style, is one of a kind in Sheboygan."